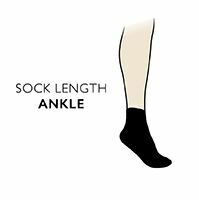 Helping you to keep on running in comfort, Falke Light Ergonomic Cushioned Short Running Socks are designed to follow the requirements of your foot’s own anatomy, with a specific left/right fit and protection at all the correct points of the foot. Toes and heels are cushioned, up to and including the Achilles. A comfort top holds the socks without pressure on the ankle. Cotton air channels are placed to filter humidity away from your feet and circulate fresher air, helping prevent blisters and keep them healthier.